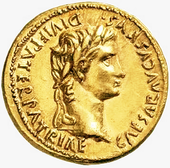 Aureus av Augustus, tann fyrsti rómverski keisarin. Rómverjaríkið í 117 e.Kr., tá ið tað var størst. a The final emperor to rule over all of the Roman Empire's territories before its conversion to a diarchy. Rómverjaríkið var eitt stórveldi, ið rakk allan vegin runt um Miðjarðarhavið og heilt norður til Bretlands. Rómverjaríkið varð grundlagt, tá ið Augustus keisari kom til valdið í ár 31 f.Kr. Rikið gekk til grundar, tá seinasti keisarin, Romulus, varð dripin av barbarum í ár 476. Hetta verður í dag roknað sum byrjanin uppá miðøldina. ↑ Aðrir mátar at umrøða "Rómverjaríkið" millum rómverjar og grikkar sjálvar, var m.a. 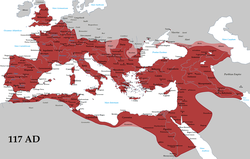 Res publica Romana ella Imperium Romanorum (eisini á grikskum: Βασιλεία τῶν Ῥωμαίων – Basileíā tôn Rhōmaíōn – ["Dominion (Bókstaviliga 'kongsríki') rómverja"]) og Romania. Res publica merkir rómverskt "commonwealth" og kann bæði sipa til the Republican and the Imperial eras. 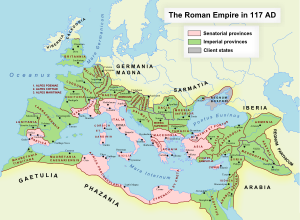 Imperium Romanum (ella Romanorum) refers to the territorial extent of Roman authority. Populus Romanus ("rómverska fólkið") var/er ofta nýtt to indicate the Roman state in matters involving other nations. The term Romania, initially a colloquial term for the empire's territory as well as a collective name for its inhabitants, appears in Greek and Latin sources from the 4th century onward and was eventually carried over to the Byzantine Empire (see R. L. Wolff, "Romania: The Latin Empire of Constantinople" in Speculum 23 (1948), pp. 1–34 and especially pp. 2–3). ↑ Bennett, J. Trajan: Optimus Princeps. 1997. Fig. 1. Regions east of the Euphrates river were held only in the years 116–117. ↑ 2.0 2.1 2.2 Taagepera, Rein (1979). "Size and Duration of Empires: Growth-Decline Curves, 600 B.C. to 600 A.D". Social Science History (Duke University Press) 3 (3/4): 118. JSTOR 1170959. doi:10.2307/1170959. ↑ John D. Durand, Historical Estimates of World Population: An Evaluation, 1977, pp. 253–296. ↑ Turchin, Peter; Adams, Jonathan M.; Hall, Thomas D (December 2006). "East-West Orientation of Historical Empires". Journal of world-systems research 12 (2): 219–229. ISSN 1076-156X. Retrieved 12 August 2010. Hendan síðan var seinast broytt 23:14, 20. des 2017.